Search "Modern comforter" 8 results have been found. Classic stripe pattern bed in a bag pattern. Camden Plaid is a modern, abstract graphic plaid in gray and white colors in easy care fabrics. Waterfall brushstroke style print in shades of aqua and gray for a dramatic statement for your bedroom. 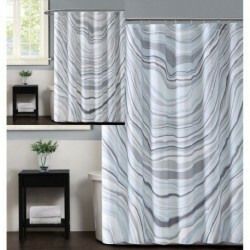 Graphic marble style print in shades of blue and gray comforter sets and accessories for your bedroom. Artistic brush stroke pattern for a dramatic statement for your bedroom in this designer bedding collection. Talia is a sweeping photo realistic style print in shades of blue and white with accessories.